Hairline-textured metal surfaces give ASUS VivoBook an elegantly sleek form packing full features. It offers intuitive computing, easy mobility, and a style you'll love. The rounded edges are inspired by book binding, making them comfortable to hold for natural grip and carry. 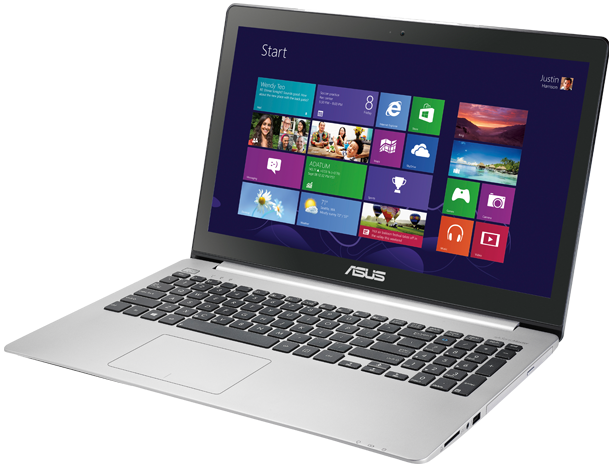 Towards premium elegance and usability, ASUS VivoBook focuses on details, performance, and functionality. It epitomizes incredible design in one sleek package. Exclusive Splendid technology delivers vibrant visuals to satisfy the most demanding viewing standards. It Fine-tunes display properties based on application, adjusting color gamut and accuracy. The results are more vibrant colors and pristine image quality in all applications, from movies to photos. Splendid technology provides four modes to accommodate different viewing conditions, so you can choose the most suitablepreset based on personal preference and environment. Meticulous aesthetic design extends to the user interface, which is attractive, immediately clear, and easy to get into. ASUS VivoBook manifests inner and outward beauty, creating a balance of simplicity and sophistication. Details such as compact power adapters improve experiences, assuring easy mobility. We avoid overly intricate designs: ASUS VivoBook minimalist subtlety is evident everywhere, including the gently rounded surfaces, and results in an eminently stylish look. With exclusive SonicMaster technology, ASUS VivoBook delivers the best audio experience in its class.Mixing design, superior hardware, and optimized software results in the ultimate sound experience. ASUS precision-crafted hardware brings bigger speakers and resonance chambers, while software tuning helps achieve spectacular audio. You enjoy deeper and richer bass, a wider range, true-to-life surround, powerful output, distinct vocals, and pristine clarity. This makes ASUS VivoBook a complete multimedia package, with every song, movie, and game sounding better thanks to carefully balanced and dynamic audio. ASUS AudioWizard has five selectable modes to meet your preferences and listening environment. Enjoy lifelike sound in music, movies, and games, with all modes fine-tuned by the ASUS Golden Ear team. The proprietary interface puts you first, so it's utterly user-friendly, offering quick and direct access to your content. It's so flexible, you can change the way it looks and feels in seconds! More responsive and accurate touchscreens form the heart of ASUS VivoBook interaction, as ASUS introduces new experiences using all-glass panels.Smooth throughout, the responsive touchscreen makes swiping, scrolling, and all other gestures quicker, more intuitive, and incredibly rewarding. With faster touchscreen response than industry standards, it's time for what you see is what you touch!ASUS touchscreens feature actuators that are a mere 6mm in size (as opposed to the 9mm industry standard) to give users an intuitive and superior touch input experience. High sensitivity actuators provide greater ﬁnger precision for better writing and even drawing. Ergonomic keyboard crafted for effortless typing input with optimized peak force and click ratios for greater comfort and faster typing, even over prolonged periods. Alongside its sleek form factor, ASUS VivoBook provides uncompromisingly accurate and productive typing experiences, reducing erroneous input. The chiclet keyboard blends in for a seamless design and uses back-assembly to ensure an extra-solid feel while resisting dust and debris accumulation for longer-lasting quality. ASUS VivoBooks are so responsive, they become part of you. In addition to amazing touch and input precision, their 2-second instant on resume means so long notebook reboot frustration! Driven by Super Hybrid Engine II technology, they offer up to 14-day standby, always ready to get back into fun and productivity whenever you need them. And while compact, within are powerful 3rd gen Intel processors up to Core i7, powering smooth HD multimedia and multitasking. 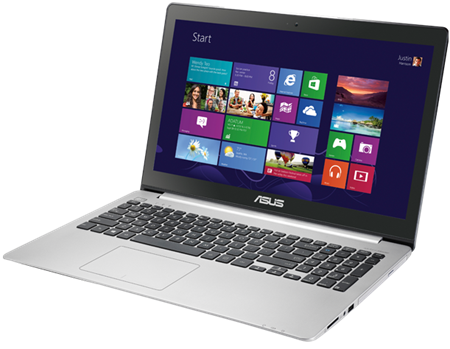 ASUS Super Hybrid Engine II technology enables 2-second instant on resume from sleep. Get back to work or enjoyment where you left off and never worry about data loss while in standby mode for up to 14 days, as data automatically gets backed up when the battery drops to 5% charge. Files and tasks are kept safe in memory, waiting for you when you get back. ASUS VivoBook S551LA are powered by up to 4th generation Intel Core i7 processors. They integrate faster processors, more powerful graphics, and an advanced onboard memory controller for smooth and responsive performance in everything from daily tasks to HD multimedia. ASUS VivoBooks can handle more applications at once without slowing down, resulting in very rewarding usage for work and pleasure, all within an extra-sleek form factor. Energy-efficient components like new Intel Core processors help achieve up to 6 hours of battery life per single charge on ASUS VivoBook, so you can get a whole day's work done before recharging. ASUS VivoBook improves over conventionally-made li-on batteries, with polymer power packs that extend battery recharge-cycle endurance and efficiency up to three times to give you better long-term usage. ASUS cloud services provide the most complete platform for online living that's accessible anywhere from a host of devices. With ASUS WebStorage, convenience is the main priority, offering you easy storage, sharing, and syncing of everything from business presentations to photo albums and favorite multimedia content. Each ASUS VivoBook comes with 3GB of WebStorage space free for the three years, and offers you the MyBitCast app so you can easily sync your content to multiple devices and accounts simultaneously.